Washington Performing Arts’ tuition-free summer camps open on Monday, June 23, 2014. All camps are open to the public. Free breakfast and lunch are provided for all camps (supported in part by the DC Free Summer Meals Program). All venues listed below are subject to change. June 23 - June 27, 8:30 a.m. to 3:30 p.m.
June 23- June 27, 8:30 a.m. to 3:30 p.m.
July 14 – July 25, 8:30 a.m. to 3:30 p.m.
August 4 – August 8, 8:30 a.m. to 3:30 p.m. 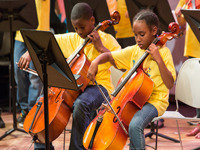 Since 1965, Washington Performing Arts has had a foundational role in the arts in our nation’s capital, creating profound opportunities that connect community and artists, in both education and performance. Through live events in 11 venues that criss-cross the D.C. metropolitan area, the careers of emerging artists are launched and nurtured, and established artists return to develop closer relationships with Washington Performing Arts audiences and creative partners. As one of the leading presenters in the nation, Washington Performing Arts embraces a broad spectrum of the performing arts, including classical music, jazz, gospel, contemporary dance and music, international music and art forms, and new work. Dynamic education programs in the public schools and beyond, are hallmarks of Washington Performing Arts, as are Washington Performing Arts’ Embassy Adoption Program and two resident gospel choirs. In the 2012–13 season, Washington Performing Arts was twice honored for its work at the intersection of arts presenting and education: by President Barack Obama with a National Medal of Arts (becoming only the fourth D.C.-based arts group and the first arts presenter of its kind to be so honored), and the Mayor’s Arts Award for Excellence in Service to the Arts.